In my previous post, I have mentioned about the news that chrome removed Instant Extended API Flag from the latest version. If you are one of the them who use that option to remove Google search box from the new tab page, then here is a chrome extension called “Replace New Tab Page” to remove this new tab design. I’m one of the user who used Instant Extended API Flag to remove that search box from the new tab. But due to the new update by chrome, we don’t have that option anymore. Here is a small workaround to fix this issue. This tip was given by Shane Kirk on Google forum. Replace New Tab Page is a Google chrome extension to replace new tab page with any other page that you want. For example, you can place any of the website URL that you wish to open every time you open a new tab, or you can set any chrome flags. In my case, I just set chrome apps flag (chrome://apps) to open chrome apps page in a new tab instead of that Google search box tab. If you wish to set that to any other domain, then you set that too. 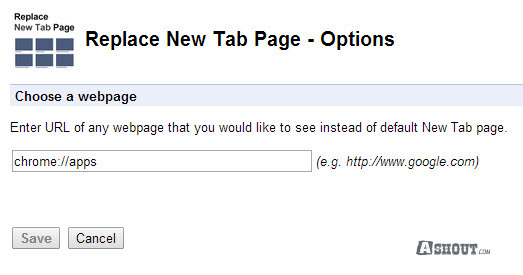 To remove that Google search box form new tab, first install Replace New Tab Page extension. Once you install, you will get an option to fill a web page. Here you can fill any web page that you want to see every time you open a new tab. You can also use Google Chrome flags in that address. For example, place chrome://apps flag to open Google Chrome apps page every time you open a new tab or new window. Thus you can get rid of that Google search box with thumbnail images on the new tab. To be frank, I’m still not happy with the result what I was getting from this workaround tip. Why because every time you open a new tab you’ll see some small delay in loading that tab. If you don’t mind about this delay, then you try this tip. Update 2: As one of our commenter added a new option to display completely blank page with this extension. To display the blank page when you open a new tab, set URL to display:none and save it. I just came across a new extension called Empty New Tab Page. I highly recommend this extension over the above method. What this extension will do is, it completely removes the new tab page design (Google search box with a thumbnail of visited websites) and replaces it with complete blank/empty page. The only thing you need to do is, just download and activate this extension. There is no option to configure anything. Once you activate this extension, the default new tab page design will completely remove and replaced with the empty page. I also noticed that there is no delay in opening a new tab, which is happened in the previous extension. So if you are annoyed with the Google Chrome new tab feature, then you must try this extension. This extension works almost similar to Extended API Flag method to remove that new tab page design. Thank you very much for solving the problem AND publishing the solution! It seems, it is a permanent fight against these fu**king ignorant Google-idiots! or use StyleBot to modify CSS of that page, to look like old one. Since I need my “most visited” sites on the home page to appear (and update dynamically), I can’t use a blank home page. My solution for now is to use Stylish to simply set the whole search box to display:none. Hopefully someone will find a more elegant solution soon. Thanks for display:none tip, I just updated the post with this option as well. You can use the hide most visited extension. I’m a little late but its still great. now i can look at my theme in happiness. except for the search bar. If you change your preferred search engine in the omnibar to something that isn’t google, it will also get rid of the giant google logo and search bar on the new tab page. However, the most visited pages boxes will still be smaller. I still need Google has my search engine, but I don’t like how they are forcing us to use them has their search engine. Moreover, I really hate seeing the thumbnail of the website that we have visited. So I’m searching for an alternative solution. I still hate the fact that the thumbnails are small. This is just a way to remove the thorn from my eye… Looking forward to a decent extension, which will restore previous functionality. thanks for the replace default search engine tip to get rid of the Google search box. Could you explain in detail how to do what you are suggesting? I don’t know how to do this-what do you mean by “replace new tab page with any website”? And then “replace it with Google Apps/Flag? How do you do this? Dude take your time to understand this post. Read it slowly, then you will get know how to do this. “replace new tab page with any website”? Its a google chrome extension. I recommend you to follow “Update 1:” method. Is there any way we can keep the 8 thumbnails of recently visited sites but get rid of that large hideous google logo and search bar? Most helpful solution I’ve come across so far, thank you. Which one is better extension for Chrome…”Empty New Tab Page” or “Blank New Tab”….one review in the latter says Blank New Tab uses less RAM (faster!). 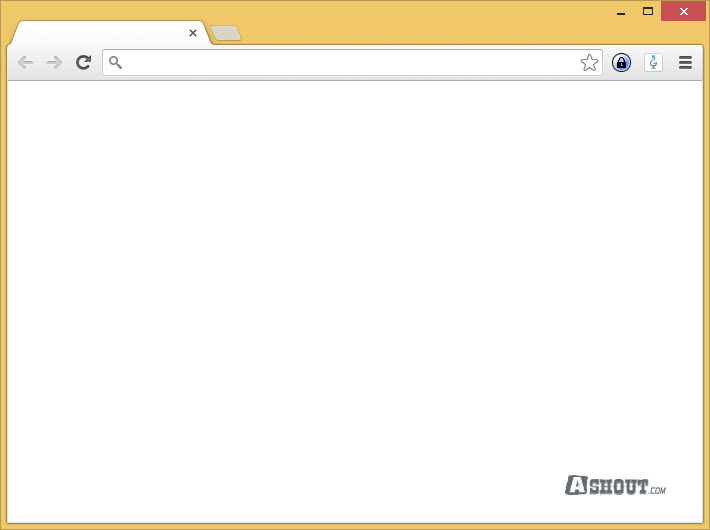 Just added “Empty New Tab Page”, and it looks like it’s working like a charm. Plain Jane, no frills, pages load quickly, and best of all, the thumbnails and the ridiculous search bar are finally gone. I don’t browse questionable content on the web, but it honestly shouldn’t be anybody’s business what I search for, and I found that a complete invasion of my privacy, considering I use my laptop for both home and office – thanks Google, for making us have to work around your lame and intrusive format. And thank you sincerely for the info, Arun. As an addendum, I read some complaints in reviews of adware being installed alongside “Empty New Page Tab”, but I have AdBlockPlus running, and I haven’t encountered any ads being blocked on newly opened tabs or any malware being installed. I’ll update if this becomes a problem. “Empty New Page Tab” works like a charm. many thanks Arun ! Thank you so much! I have been trying to get rid of this thing for a long time! I can’t believe that it was this easy! How can i hide google search in a new tab. there is no option to hide in chrome broswer.